Discussed are the main defects of side frame castings that are characteristic for various foundries producing such castings. In most cases they include blowholes on the side of cores and mold, as well as nonmetallic inclusions. Proposed are techniques that allow to improve quality of side frame casting. Key words: defects, oxidized blowholes, nonmetallic inclusions, oxide scabs, venting system. Theoretical and practical aspects of application of physical modifying influences are considered at reception of foundry aluminum alloys. Keywords: aluminum alloys, physical modifying influences, crystallization, quality of molding, microstructure, secondary raw materials, concentration and temperature gradients. Especially in North America there has been a widespread use of flaskless moulding machines with horizontal separation for some decades. Since the late 1990's, this technology has been further developed on the basis of the Disamatic principle. The article describes the moulding process, its auxiliary equipment and the transport of moulds through the pouring and cooling lines. An account is given of the experience of North American jobbing foundries, as these have been using the machines since the start of the century, and examples are shown of their production of pattern plates, sand moulds and cast parts. Presented are results of investigating the technology of combining casting and forcing through in uniform-hole steppeddies. Analysis of the investigation results shows that the implementation of the method is possible under the condition that forcing-through resistance is lower than the required nominal force of the hydropressing unit, the value of which can be determined by formulas used in the work. 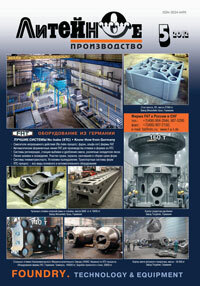 Keywords: forcing through, gating system, solidified casting, die holes, mold, punch. Palienko G.V., Okhrimenko G.P. Experience and Prospects of Casting Quality Improvement under the Conditions of PAO "Sumy M.V.Frunze Research-and-Production Association"